Taking a Hong Kong taxi is a bargain compared to the prices in other major cities, such as London and New York, and you’ll find people hopping in a taxi in Hong Kong far more frequently. And, with nearly 20,000 cabs roaming the city’s streets, you shouldn’t find it hard to hunt one down. Taxis in Hong Kong are safe, reliable, and well-regulated. The first thing to note is that there is only one taxi firm in Hong Kong, and it is run by the Hong Kong government. There are no private taxi companies or minicab firms in Hong Kong. Hong Kong taxis come in three colors, and each type of taxi is only allowed to service certain parts of Hong Kong. Uber has launched in Hong Kong, although it is not as popular as in other large cities. Red: These are urban taxis and have the right to operate throughout Kowloon, Hong Kong Island, and the New Territories, including Hong Kong Disneyland. These are the taxis you’re most likely to see. 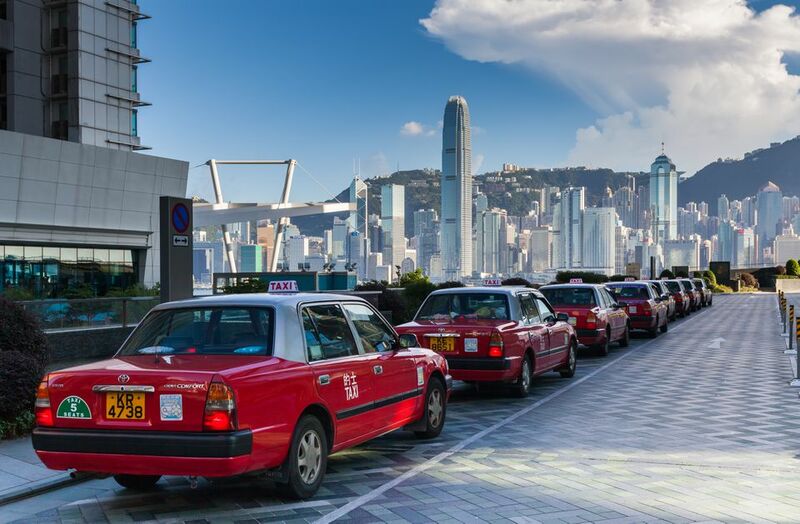 Be warned: although the taxis have the right to travel throughout the territory, many won’t cross the harbor between Hong Kong Island and Kowloon. You’ll need to go to the Cross-Harbour taxi ranks, such as at the Star Ferry terminals. Green: These are "New Territory" taxis and only have the right to operate in the New Territory area, including Disneyland. Blue: These are Lantau taxis, and they only have the right to operate on Lantau Island. Aside from rush hour between 5 p.m. and 7 p.m., and late night weekends, there is always an abundance of taxis to be hailed from the street. Just stick out your hand. Compared to most taxi drivers around the world, Hong Kong taxi drivers are incredibly honest. They are so heavily regulated and monitored by the government that it’s hard for them to pull off any scams. Just be sure they turn the meter on. Do Taxi Drivers Speak English? In general, no. If you’re heading to a major landmark or destination, say Disneyland or Stanley, then drivers will generally understand, and some drivers understand English well. However, for the most part, they will only speak Cantonese. In these situations, they'll ask you to say your destination into the radio and the base controller will translate for the driver. Uber hasn't really taken off in Hong Kong because very few people own cars or drive. It means that there are fewer Uber taxis available than in the likes of London or New York, and you'll usually wait longer for pick up than trying to hail a standard taxi. They are, however, on average 20 percent cheaper than taking a government taxi. What Are the Proper Ways to Tip in Hong Kong? Where Do You Catch One of the Over 5,000 Minibuses in Hong Kong? What Jobs Are Available for Expats in Hong Kong?